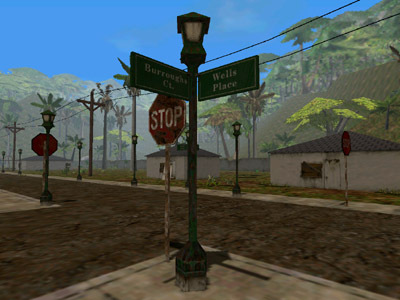 The town of Burroughs was named after Edgar Rice Burroughs, an American author best known for his creation of ‘Tarzan’ and works such as the ‘The Land That Time Forgot’ series. 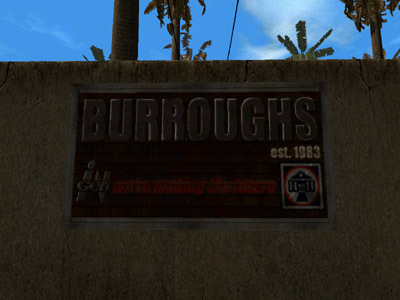 The town sign reveals that Burroughs was estabilished in 1983. Hammond also had an Edgar Rice Burroughs statue erected in the courtyard of the town. 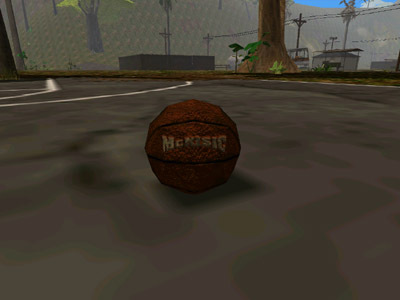 The name ‘McKisic’ on the basketball is a reference to Kyle McKisic, who was a lead artist on the Trespasser team. Originally, triggers for an Anne voiceover were placed inside the baskets. After scoring at both baskets, Anne would say “Nuthin’ but net”. Though the voiceover would continue in an infinite loop, which is probably why the triggers were moved to the back of the baskets. 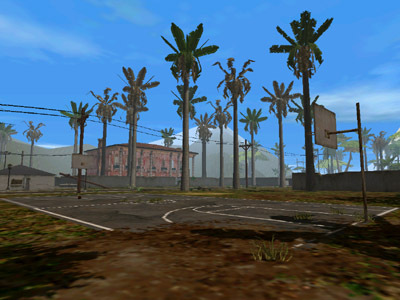 In theory, it should still be possible to use the basketball to activate the triggers – though it would require an incredible amount of patience. Note: Once the voiceover is activated, it will play in an infinite loop. 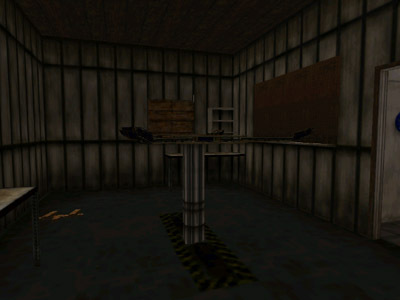 To restore normal gameplay, either load a savegame or restart the level. 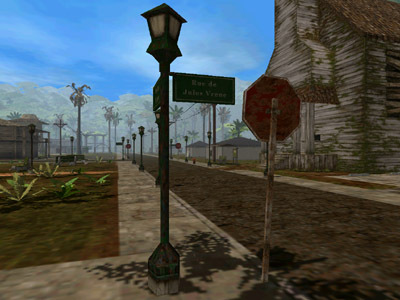 The streets of the town are named after various famous authors. ‘Burroughs Ct.’ is named after Edgar Rice Burroughs. ‘Wells Place’ is named after H.G. Wells, an English author whose best known works are ‘The Time Machine’, ‘The Island Of Docter Moreau’and ‘The War Of The Worlds’. ‘Rue De Jules Verne’ is named after Jules Verne, a French author whose best known works are ‘Twenty Thousand Leagues Under the Sea’, ‘A Journey To The Center Of The Earth’ and ‘Around The World In Eighty Days’. 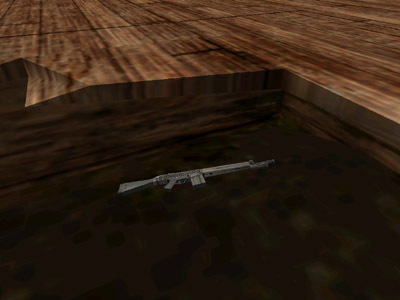 Inside the hole in the floor of the church, an HK91 is hidden just underneath the terrain. 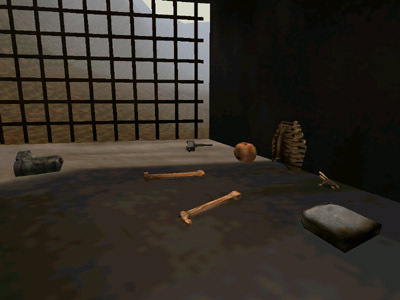 When standing inside the hole, turn on the ‘bones’ cheat to reveal the outlines of the weapon. 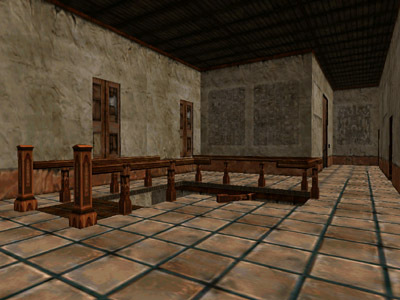 A Lindstradt tranquillizer rifle can be found inside the church. 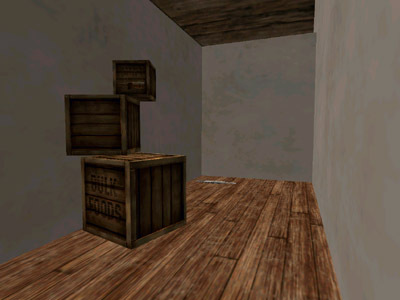 It is located behind some crates in a room on the first floor. 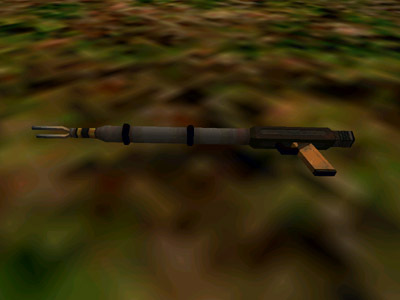 This fictional weapon first appeared in the Lost World novel, in which it was specially manufactured in Sweden for Dr. Richard Levine. The rifles are used by Eddie Carr, Sarah Harding, Kelly Curtis, Jack Thorne, and Richard Levine. 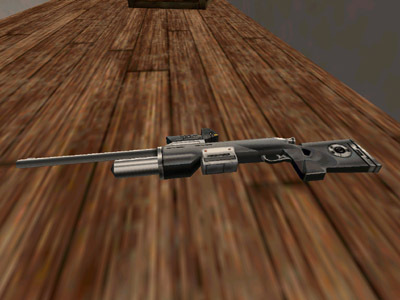 In the Lost World movie, the rifle is primarily used by Eddie Car. 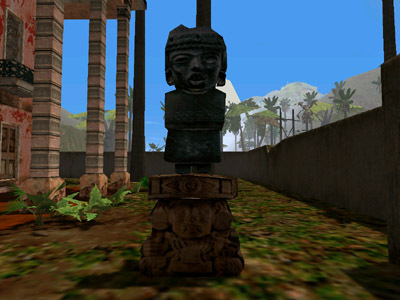 It can be found in various locations throughout the game. 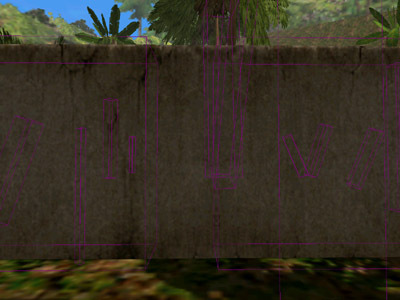 A small segment in the west wall of the town contains a trigger that will start up the TestScene level. 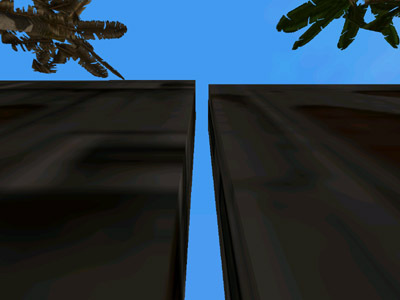 To activate the trigger, travel to the coordinates and face the wall. 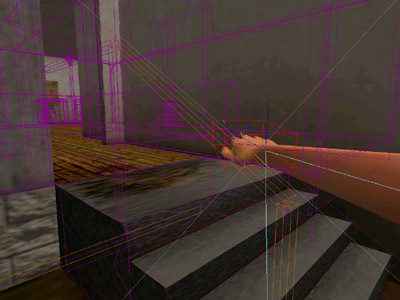 Now turn on the ‘bones’ cheat to reveal an opening in the wall – slide through this opening to load the TestScene level. Near this lamp post, the trigger for an Anne voiceover is placed too high. In it, Anne wonders how Burroughs got its electricity, and that the town must have had a generator. 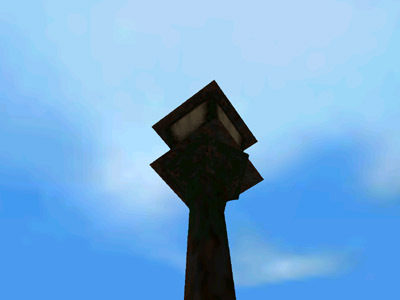 To play the voiceover, either repeatedly jump up at the lamp post or find a box to jump up from. 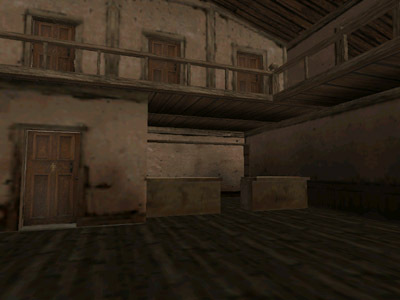 At the bar of the saloon, Anne is supposed to reveal that it would probably not be a good time for a drink, even though she might like one. However, the trigger for this voiceover is placed too high. 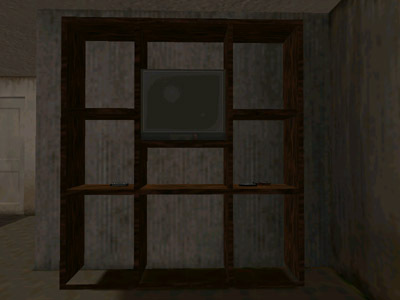 To play the voiceover, climb the left part of the bar and jump up. 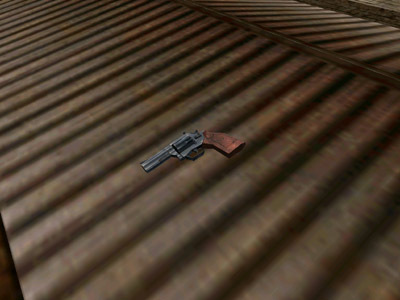 A Smith & Wesson 686 can be found on top of this bus stop cover. 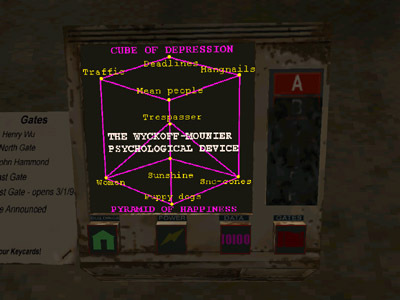 Rich Wyckoff and Michael Mounier, who were both members of the Trespasser team, hid something they called ‘The Wyckoff-Mounier Psychological Device’ within the Operations Center security console. 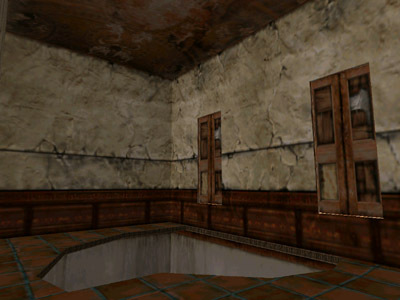 To access it, first go to the gas station restroom and notice the symbols located on the wall below the sink. 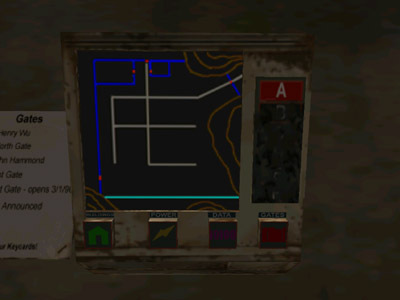 These symbols are actually a code, representing the security console buttons. There is another way to enter the security office. 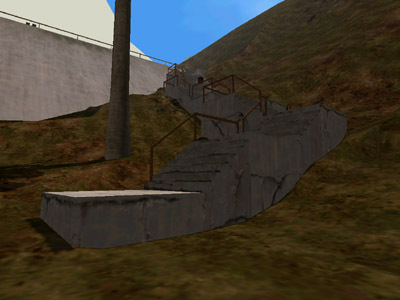 Climb the stairs to the helipad – there is a broken section of railing at the top. Jump out through the gap and Anne will land on the roof of the Operations Center. She will take some damage and will need to wait a few seconds to regenerate health. 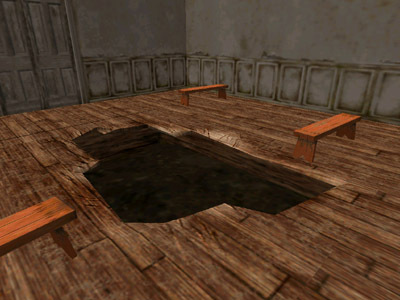 After that, walk over and drop through a gap in the skylight, into the security office. The door will unlock itself after having activated the power on the security console. 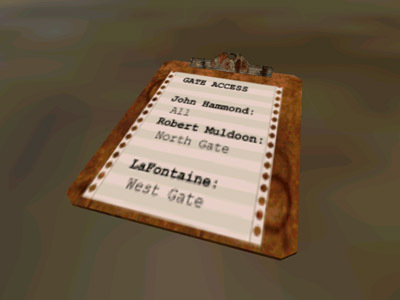 It is possible that LaFontaine and the West gate are a reference to Oskar LaFontaine, a German ex-minister who wanted to slow the amount of asylum seekers entering West Germany. In 1989, one year before the reunification of Germany, he urged caution about German reunification and stressed the economic difficulties and the cost. 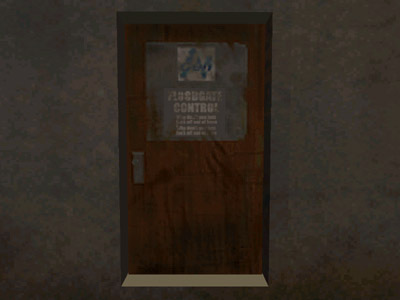 In Trespasser, a character named LaFontaine was entrusted with the keycard that opened the West gate, which wasn’t scheduled to open until 1990 – the year of the German reunification. At the lift in the gas station garage, the trigger for an Anne voiceover is placed too high. In it, Anne mentions that Hammond must be the one with all the fun, satellite phones. 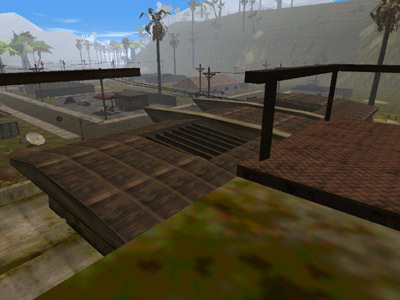 To play the voiceover, either jump up at the lift or climb the roof of the gas station. 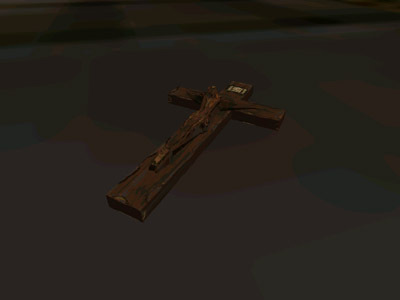 A wooden crucifix can be found in one of the rooms of the worker barracks. It has an inscription which reads ‘INRI’, an acronym of the Latin inscription ‘IESVS·NAZARENVS·REX·IVDÆORVM’. In English, it is translated as ‘Jesus the Nazarene (Galilean), King of the Jews (Judeans)’. The puzzle to unlock Wu’s gate from within the Operations Center can be bypassed by stacking some crates and hopping his gate. It may require some creative jumping, but it certainly can be done. 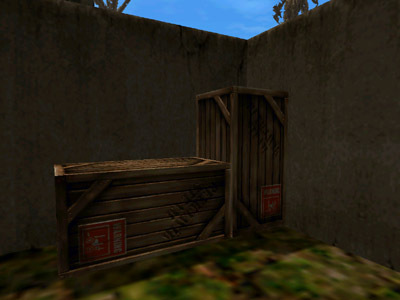 Though it would seem unlikely players would do this, the developers seem to have taken the possibility into account anway, placing two large crates near Wu’s pool that allow the player to get back out again. 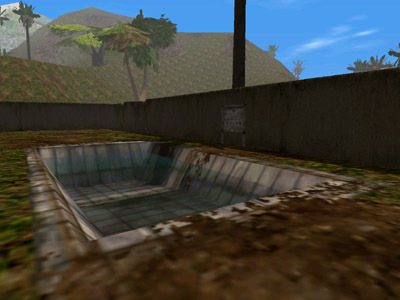 Please take a shower before entering the pool. ask questions later. That be the Law a**hole. of my house. No exceptions……! Thank you. Anne is supposed to comment on Wu’s stereo, but the trigger for this voiceover is placed too high. To activate it, get the minitower from the nearby desk and place it in front of the stereo. 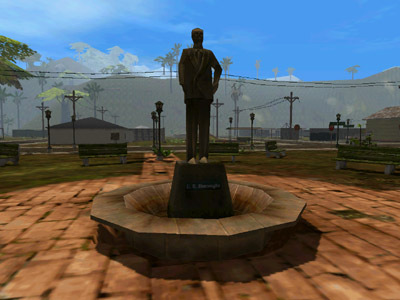 Now stand on the minitower and jump up to play the voiceover. 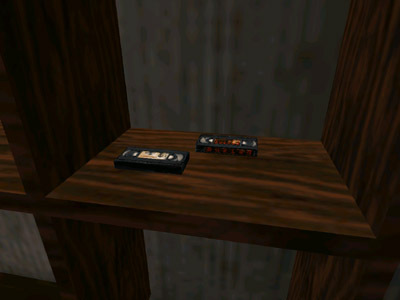 The videotapes near the stereo are labeled ‘Buried’, ‘Chompers’ and ‘Zombie Love’, all fictional movie titles. 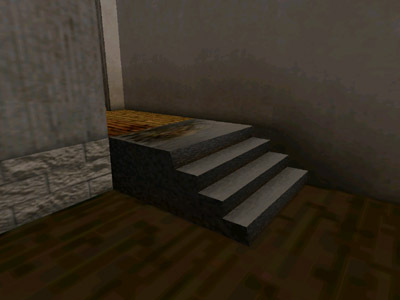 The stair rail in Wu’s house was removed at some point, though its physics remained in place – resulting in an invisible stair rail. 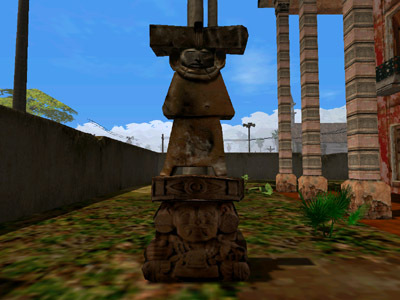 The front of Hammond’s house is decorated with two Mayan statues, possibly taken from the Mayan ruins located in the Ascent levels. 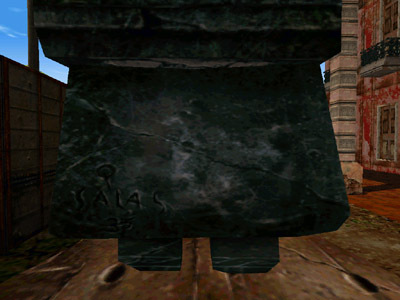 The pelvis and bottom part of both statues read ‘P Salas 35’. 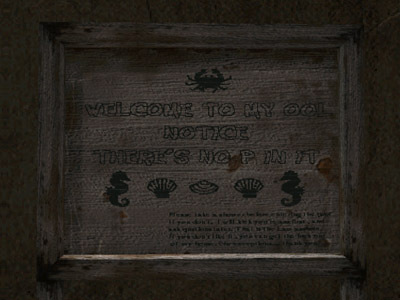 This is a reference to Philip Salas, who was a lead artist on the Trespasser team. 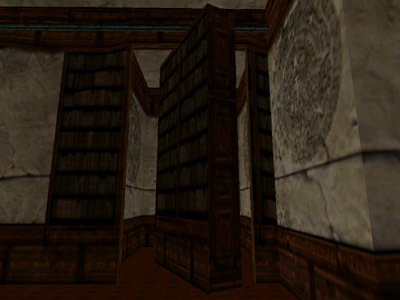 There is a secret room with a floppy disk behind this bookcase. 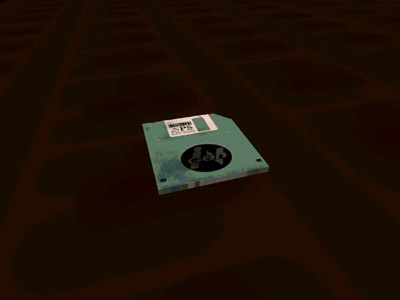 The floppy disk contains an old diary of Hammond from the 1950s, which can be accessed by using it with the computer in his office, located on the first floor. 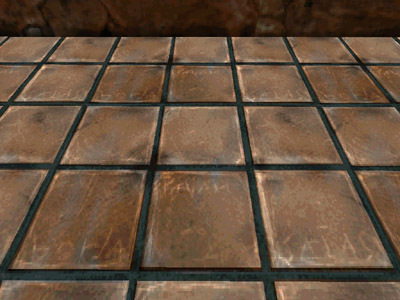 The floor tiles in the hallway of the first floor have the name ‘Borja Priam Salas’ scratched on it. 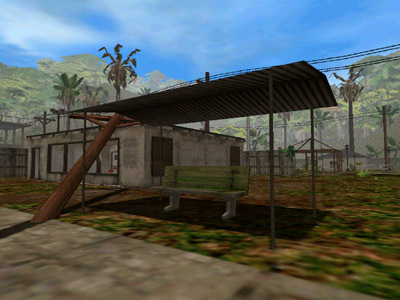 Philip Salas, who was a lead artist on the Trespasser team, designed the house and wanted to dedicate it to his eldest son, Borja. 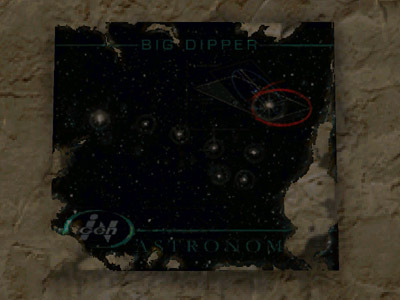 The Big Dipper poster has the Dubhe star circled with a red marker, which is a clue as to where something is located. When looking outside the window, notice that the large rocks in the backyard are set up in the shape of the Big Dipper, just like in the poster. 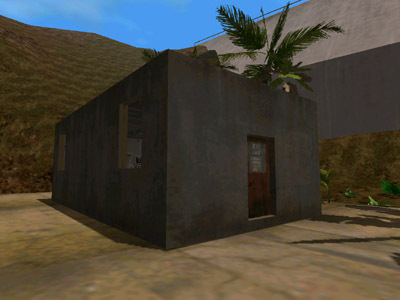 The rock that represents the circled Dubhe star is where the white keycard needed to enter Hammond’s office can be found. 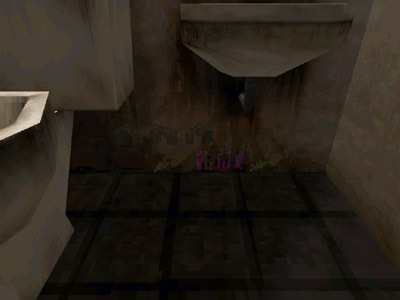 Originally, the keycard was supposed to be hidden under a rock, but this was ultimately changed. 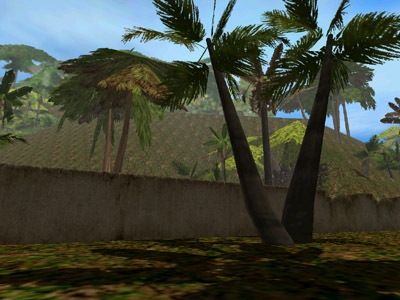 It is possible developers feared the keycard would be too difficult to find. 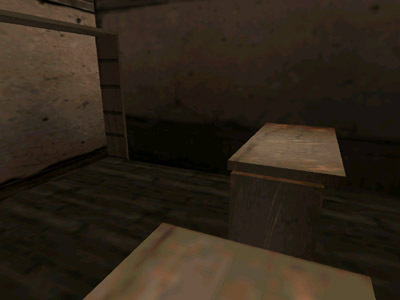 A tazor can be found on a windowsill right next to the Big Dipper map. 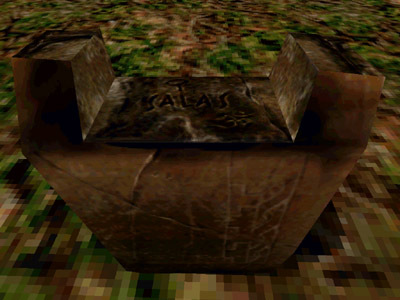 It is the same tazor seen used by Dieter Stark in the Lost World movie. 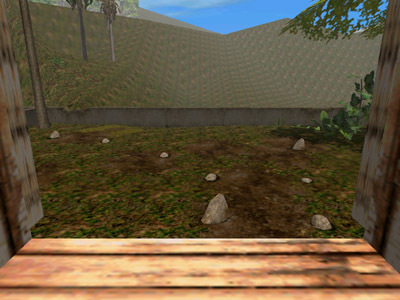 The weapon was possibly placed here to ensure that players would notice the rock formation in the backyard. 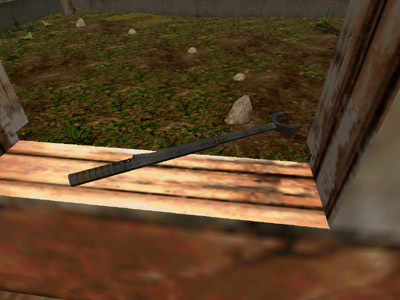 An unused variant of the weapon can be found outside the playing area. 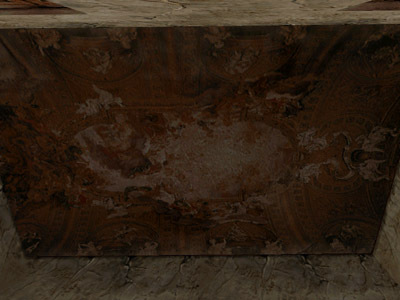 The ceiling painting in the study represents Giovanni Battista Gaulli’s ‘The Worship Of The Holy Name Of Jesus’, found in the Church Of Jesus in Rome, Italy. The ceiling painting in the master bedroom represents Andrea Pozzo’s painted ceiling in the Church Of Saint Ignatius Of Loyola at Campus Martius in Rome, Italy. 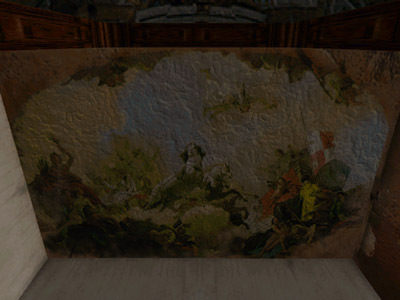 The ceiling painting in the master bathroom represents Giovanni Battista Tiepolo’s ‘Apollo In His Sun Chariot Driving Beatrice I To Frederick I Barbarossa’, found in the Würzburg Residenz in Würzburg, Germany. 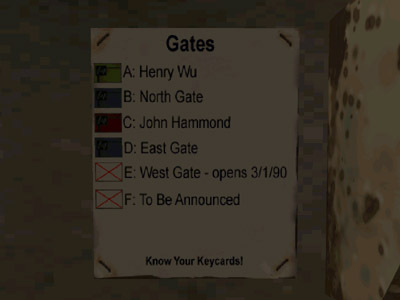 It is possible to pass the East gate without unlocking it with the purple keycard. 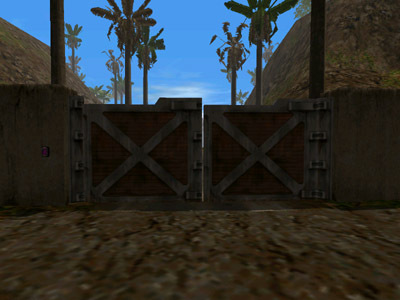 To do so, place Anne against and between the East gate doors as depicted in the screenshot below. 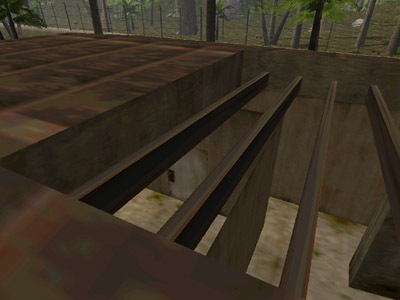 Now look up and repeatedly press the jump button – Anne will move up against the gate, eventually either passing through it or reaching the top and passing over it. 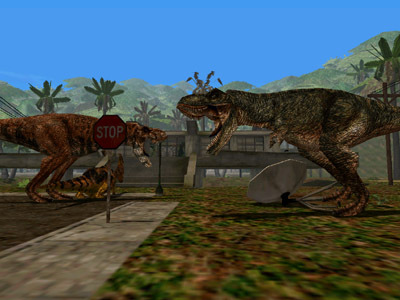 It is possible to move the Tyrannosaurs into the town, though it will require some patience. 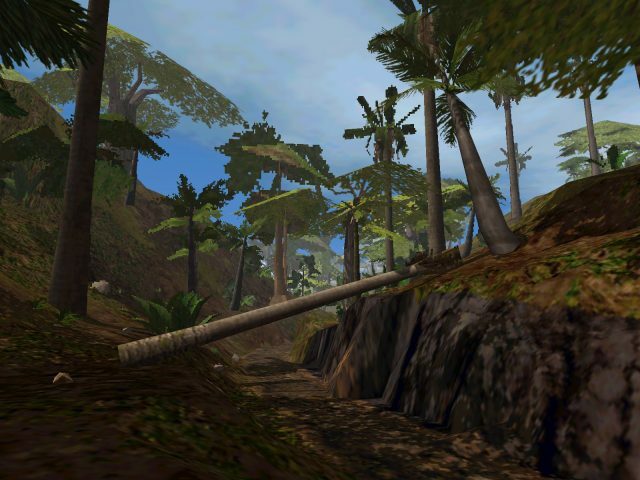 The Parasaurolophus is scripted to stay near one of the trees at its starting location, while the Tyrannosaurs are scripted to stay near the Parasaurolophus itself. So in order to move the Tyrannosaurs, the Parasaurolophus must be moved. 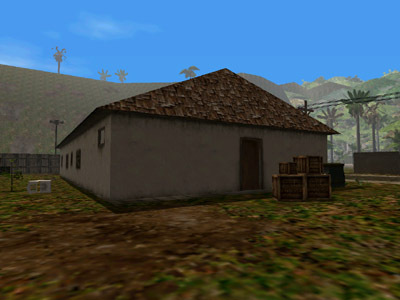 Find an AK-47 in one of the worker bungalows and turn on the ‘dinos’ and ‘woo’ cheats. 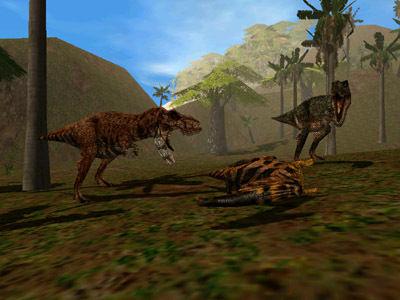 Now head over to the Tyrannosaurs and kill the Parasaurolophus. 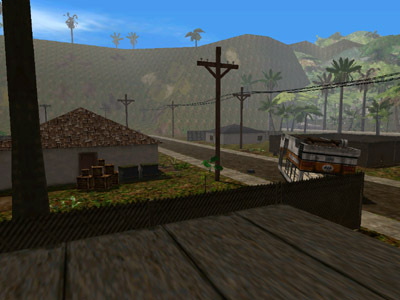 The AK-47 can now be used to move its body over to the town. 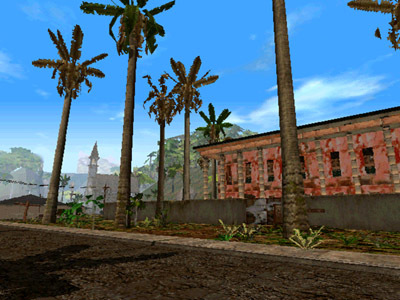 Once it is in place, head back to the Tyrannosaurs and turn off the ‘dinos’ cheat – the Tyrannosaurs will head straight for the town. Why don’t you just f*** off out of here. 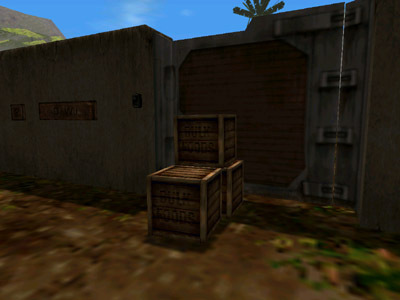 Just behind the floodgate control building, a supply locker is located. 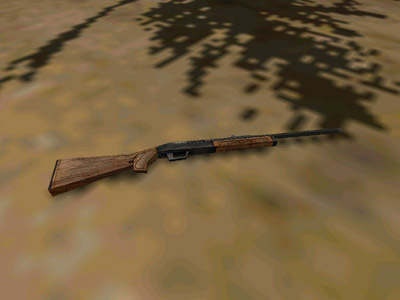 Near it, a Hunting Rifle is hidden just underneath the terrain. 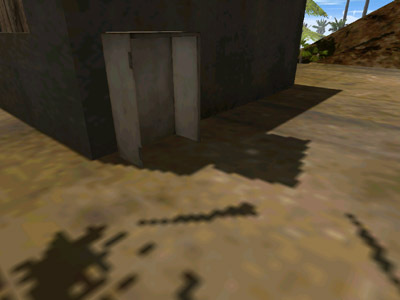 Its shadow should be visible on the ground, walk into it and the weapon should reveal itself. The lever inside the Flood Control building will open the flood gate. 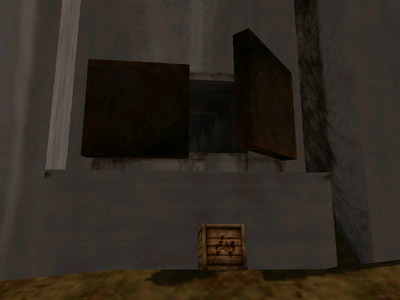 Place a box under the opening and jump onto it to enter the vent. Follow it to the end to reach the skeletal remains of Harold Greenwood, who left behind two Pac-10’s. Hammond mentions that he was introduced to him as a former Green Beret in 1992. An American who claimed to be a friend of his former son-in-law. Greenwood had asked a number of questions about the disposition of the InGen technology. 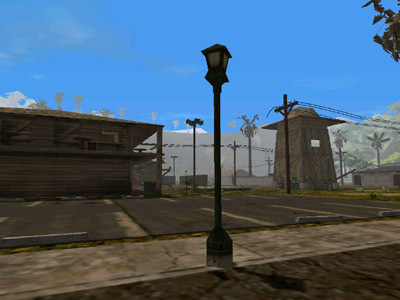 An unused Hammond voiceover reveals that Greenwood carried an electronic device he had built himself, based on plans that he found on the internet. 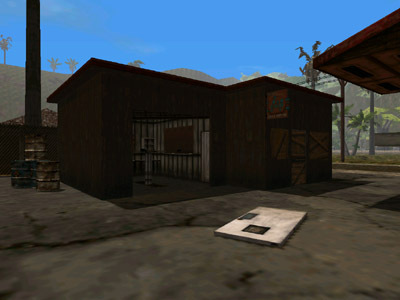 Greenwood has often been speculated to have been a BioSyn spy. 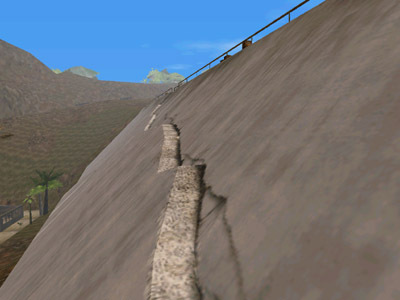 An alternate way to enter the vent is to climb the stairs and walk along the crack in the dam, following it to the floodgate.